I had some fun items that I was going to really spend a lot of time writing about this weekend. I had a great call to Eric Hogue this morning and my day was going great for a Friday. I was looking forward to writing lots on my blog. As I was sitting down at the computer I got the phone call that I had dreaded since I was a teenager. It was my dad. He told me that my grandfather had died. 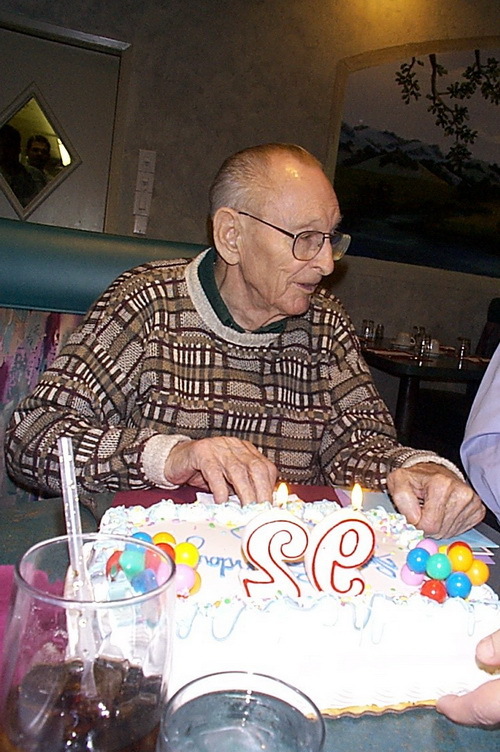 My grandfather was 96 years old and it seemed that he would live forever. Ray was born in Oroville and spent most of his youth in Arbuckle. He did lots of manual labor as a young man. He did many things over the course of his life. He was a cattle rancher, a rice farmer, owned his own rice milling company and did many other jobs related to rice milling. In his later years, he came up with a quick cooking wild rice and invented more energy efficient systems for rice milling and drying. He loved hunting and fishing. Deer hunting and trout fishing stories were always welcome subjects for discussion. My grandfather spent many deer seasons at the Jackson Ranch west of Arbuckle. As I understand it he went hunting there almost every year from the late 1930s until the 1970s.There was no hunting during World War Two and as a result the Jackson Ranch was teaming with game during the 1950s. By the time I went hunting there with him, the deer were very scarce. In the 1960s and 1970s he also spent the second deer season at the Anderson Ranch west of Willows. I remember exiting Interstate 5 at Norman-Princeton Road many times as a kid. His 1946 Willies Jeep was always in tow behind his old Ford Ranchero. At the Anderson Ranch, I killed my first deer at age ten. It was the weekend of the big slaughter. We got thirteen deer in two days. My deer was the biggest. My dad and other grandfather, Jim, were with me in his International Scout. When we got back to camp, my Grandfather Ray was happy for me. My grandfather also loved trout fishing. He took his three children to Stonyford to catch fish. They also spent many summers at Lake Tahoe and the Truckee River. In his 50s and 60s, my grandfather spent his time fishing in Lake Berryessa. He liked the lake so much that he bought a place at Steel Park Resort. He tried retirement at age 65 but he got bored with that after about a year and went back to work. My grandfather had seven patents related to rice milling, drying and production. While he could never make any commercially successful, he always hoped that they would catch on. In an earlier age, he might have been as revered as a pioneer in the rice industry but he never got the recognition that he was due. Grandfather loved to talk about politics. My earliest recollection of talking politics with him was about the symbols of the two major parties. Democrats had the symbol of the donkey because they were jackasses. He hated labor unions and loved Richard Nixon and later Ronald Reagan. He and my step-grandmother used to watch All In The Family. Grandma used to tease that Archie Bunker was based on my grandfather. For most of his life, my grandfather had a hatred for God and religion. It was the area of his life that held bitterness. God and ministers were usually described with curses and profanity. I have prayed for him since I was a teenager. In the last few years, he seemed to loose much of his hostility towards God. His cussing was noticeable decreased and he seldom used Gods name in vain. A few months ago, my parent’s pastor started calling on him on a regular basis. About three months ago, he prayed the sinners prayer with the pastor. The pastor continued to look in on him from time to time. The active rebellion towards God was gone. He seemed at peace with the world and his maker. He died this morning in his sleep. I love him and wish the peace of our Lord Jesus Christ be upon him in his eternal rest. What a wonderful story of the memories that you had of Grandpa. Two years ago in October when Grandpa got sick, I called on our old Pastor to look in on him and he never followed through. That night in the Hospital, I prayed Lord please spare his life and do not take Grandpa’s life until he accepts The Lord as his Savior. Well, as the story goes, When I started to go to West Valley Baptist Church this past winter, I asked Pastor Everston to start visiting Grandpa in St. John’s retirement home and he did just that. He took Dylon along with him, at first Grandpa didn’t want to hear about God and so they would talk about fishing and hunting. About a month and a half ago when Grandpa almost died, Pastor had a strong sense to go and visit Grandpa and talk to him about heaven. He did just that and Grandpa told him that he already had a glimpse of heaven and he was ready to go and wanted to hear more about it, so Pastor Everston told Grandpa how to know Jesus as his Savior and when I got the call that he accepted Christ as his personal Savior, I cried. Thank you for the memories of a wonderful man. He was know as “SPARKIE” to the immediate family.